So how was your weekend? Mine was GOOD! I'm finally taking a few days off and even if that mainly means packing for our move, it feels pretty awesome to be able to turn off the morning alarm! And yes, I did say move... Can you sense the anxiety of having to pack/move/unpack all of my pretties? 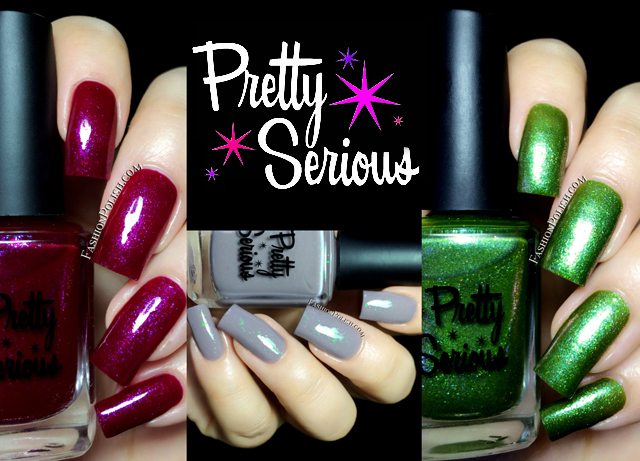 Today I have a brand new Pretty Serious trio to share with you, the Stop! Collaborate and Listen! collection, created in association with 3 girls "who know nails". Swatch And Learn is a grass green jelly with an amazing rainbow shift, and copper and gold flecks. designed by Mary from Swatch and Learn. "Since beginning SwatchAndLearn.com in 2010, my goal to communicate the importance of striving for happiness instead of perfection still remains strong. When I designed the nail-polish shade, Swatch And Learn, I was inspired by my loyal blog readers who are so diverse, supportive, and talented! Over the years, you’ve graced me with encouragement and love, which helped me persevere through many low points in my offline life. When I began blogging, I never knew how rewarding it would be! It has been the most beautiful and humbling surprise, and I thank every single one of you! My nail polish is green to represent my favourite colour, and when you look at your nails at different angles and in various lighting, you’ll see other hues sparkle and dance like a dream. These surprising flashes represent my readers, who light up my life and amaze me every day." A glorious green packed with bright, saturated sparkles that glow and catch the light like no other. I used 2 coats plus topcoat but depending on your nail length and application, a third might be necessary. Undercover Mermaid is a milky dusty pale lavender jelly with iridescent green flake and glass fleck, designed by Michelle from Lab Muffin. 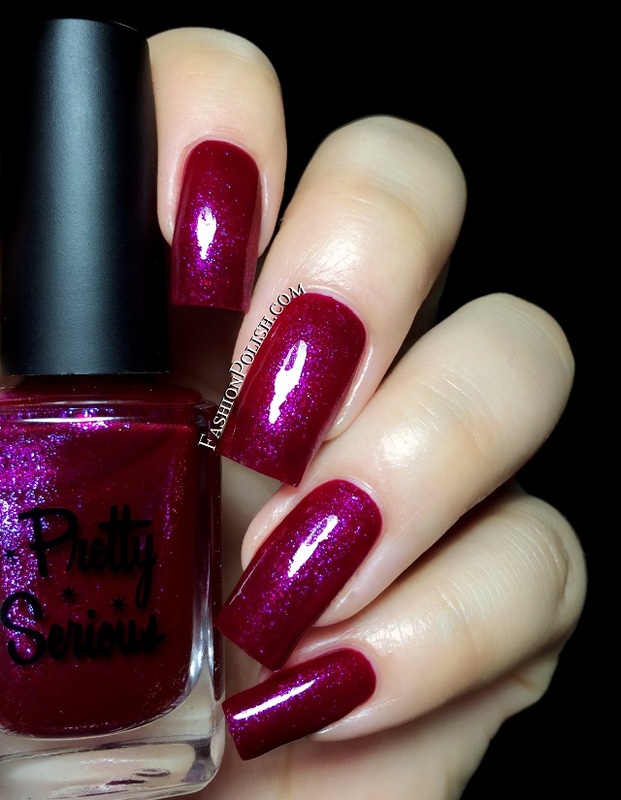 "Michelle is the blogger behind Lab Muffin, and blogs occasionally at Polish or Perish as well. She's been blogging about the science behind beauty and trying all the products for 2.5 years. Undercover Mermaid is a work safe polish with a secret - from a distance it's all sophisticated purplely taupe, but up close you can't miss the irrepressible blue-green sparkle." I love greyed out pastels and this one is right up my alley! If you're tired of boring work appropriate colors, there's no doubt the green flakies in this one will steal your heart. I used 3 thin coats plus topcoat below. Stuck In The Middle is an amazing pink red jelly with blue to purple colour shifting glass fleck designed by Kristy from @thepolishhaven Instagram. "Kristy is the blogger formerly known as The Polish Haven, who now posts her beautiful swatches on her Instagram of the same name. Student, mother and nurse, this superwoman is responsible for the insanely gorgeous and popular Pretty Serious shade Naughty Night Shift Nurse. When we asked her to come up with a follow up, she wanted to come up with a stunner and she sure delivered! Stuck In The Middle is a bright fuchsia jelly with iridescent glass fleck sparkle." So much depth and glow, I especially love how the cool toned shimmer particles stand out from the warm, almost vampy base. I used 2 coats plus topcoat here too but I could have done a third.